If ever there was a book to buy before you buy anything else, this is it. It covers pretty much everything: not just types of telescopes, but what kinds specifically are good for different purposes, and which to consider as good first telescopes. And setting up a telescope, if it’s the day after Christmas and you or a young relative are looking at a new telescope and feeling lost. And not just telescopes, but also binoculars for stargazing, and naked eye observing. And plenty of observing basics, like what makes a good observing site, whether it’s in your driveway or on the other end of an airplane ride, what to take out with you when you observe, and lots of the tips and tricks for seeing more while you’re observing. Also, sections not just on where and how to observe, but also what to observe, from atmospheric phenomena to meteor showers, the sun and moon, planets, comets, and other solar system targets, to deep sky objects like nebulae, star clusters, and galaxies. This is going to be one of those “and…and…and” reviews because the book does so much. There are seasonal all-sky maps that show the bright stars so you can learn your way around the sky and quickly get your bearings. Better still, there are twenty or so maps of selected regions of the sky showing prominent constellations, bright stars, and the best and brightest deep sky objects. The book was designed to be used in the field–it’s spiral-bound to lay flat in your lap or some other surface, hardbound for durability and to make a smooth and stable platform for the maps, and the maps are clean and uncluttered and easy to read with a red flashlight. One of my most memorable nights of stargazing was back in the fall of 2007, when I was just getting started. I spent the whole evening in a lawn chair in my back yard, with this book in my lap and my binoculars around my neck, surfing my way through almost the entire sky. If you think “spiral bound” and instantly picture bent wires and torn pages, fear not: the spiral is enclosed in the hard binding and it’s very sturdy, and the paper is thick, glossy, and durable. My copy is still like new despite three years of regular use, both by me and by all the folks to whom I’ve loaned it. I don’t know when the first edition of Nightwatch came out, but the current edition is the fourth, published in 2006, and it includes tables for planetary positions, meteor showers, and so on through 2018. Even after 2018, I’m sure I’ll keep coming back to this book to look into little nooks and crannies of the hobby that I haven’t explored yet (observing aurorae, perhaps, or building a barn-door tracking mount for astrophotography), and simply for the joy of reading Terence Dickinson’s prose. There are books that are easy to read, and then there are books that are so easy to read that the pages just fly by, and afterward you know a lot more but hardly remember how all the information got into your head. This is one of the latter. It’s also copiously illustrated with full-color photos, so it’s an attractive book to simply flip through. 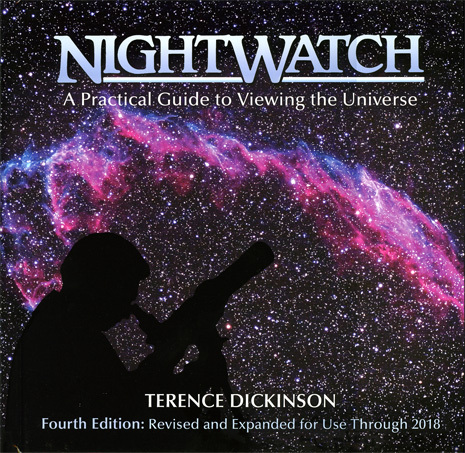 Nightwatch has a sort of “big brother”, which is The Backyard Astronomers Guide , by Terence Dickinson and Alan Dyer. If Nightwatch is a working lunch, The Backyard Astronomer’s Guide is a seven course meal with brandy and cigars afterward. It covers all the same stuff as Nightwatch and then some, and covers everything in a lot more detail, going into things like what specific brands and models of telescopes the authors prefer (and between them, they’ve used about everything). All the extra material comes at a price, literally and figuratively: The Backyard Astronomer’s Guide is about twice as thick as Nightwatch, weighs about twice as much, and costs about twice as much. It’s too thick to be effectively spiral bound–it has a very high quality sewn binding–and too clunky to take in the field, so it includes no observing charts. On the other hand, it has an extremely useful supplementary website with a blog. 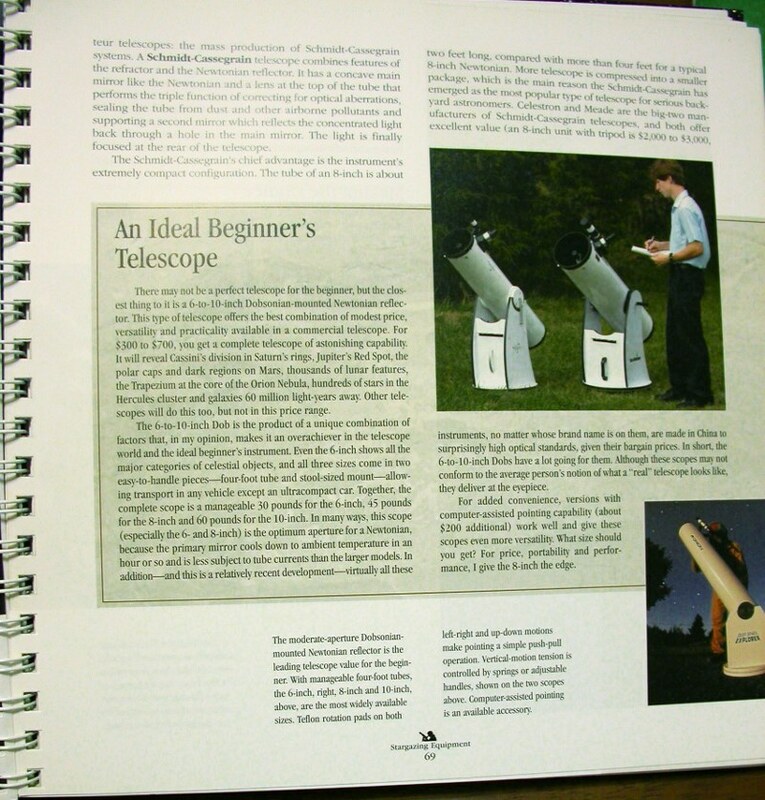 If you’re already planning to get a separate star atlas or observing guide, and you want encyclopedic coverage, and you don’t mind paying more, get The Backyard Astronomer’s Guide. But if you’re just getting into amateur astronomy, or if you just got your first telescope and you’re thinking, “Now what?”, and you’re looking for a good all-around introduction to stargazing, get Nightwatch. Covers almost everything adequately enough for beginners, but almost everything is covered in more depth somewhere else. That’s not really a con, more like an inevitable trade-off. No book can be a good introduction AND a exhaustively thorough at the same time, not and remain inexpensive and approachable (although The Backyard Astronomer’s Guide comes close, and fails mainly in being the heaviest and most expensive astronomy book on my shelf). Sky maps don’t show many stars, which can make it tough to get to some of the objects. As a field resource, most people who stay in the hobby will outgrow it fairly quickly. But the maps are only a small portion of the book, and the rest of the material will be interesting and useful indefinitely. Recommended? Heck yes. Enough to make it my first loaner to people who are thinking about getting into astronomy (unless it’s already loaned out, in which case I fall back on The Backyard Astronomer’s Guide), and enough that if anything ever happens to my copy, I’ll replace it in a heartbeat. I’ll second Matt’s recommendation on these. I have bought a few astronomy books over the passed year, mainly at a used book store, so with limited availability. I finally broke down and ordered a new copy of NightWatch, along with the Pocket Sky Atlas and Turn Left at Orion. 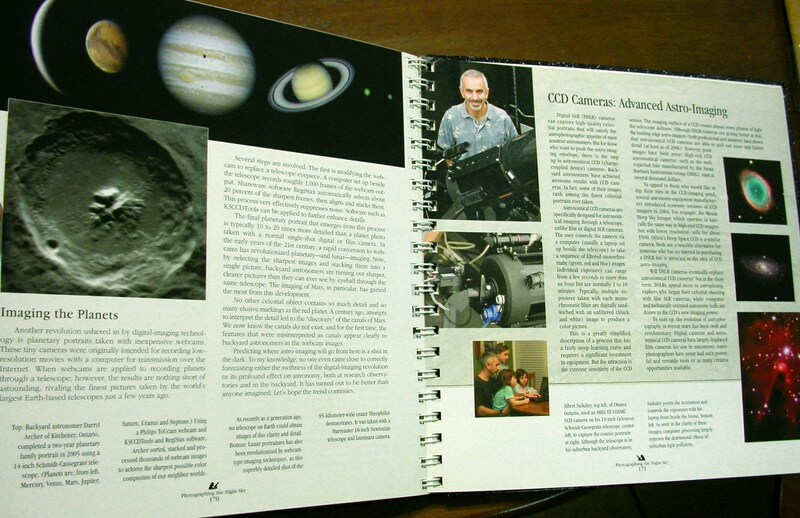 While waiting for these to come in the mail, I ran across a copy of Backyard Astronomer’s Guide, so bought it. Needless to say, I have a lot of reading to catch up on, but all these books are also good for browsing. I should probably have bought these all a year ago when I was starting out. However, they are still helping me even with a year of viewing and reading other material under my belt. If nothing else, it puts everything I have discovered the hard way into one nice set of books for future reference. I have this book and it is superb. 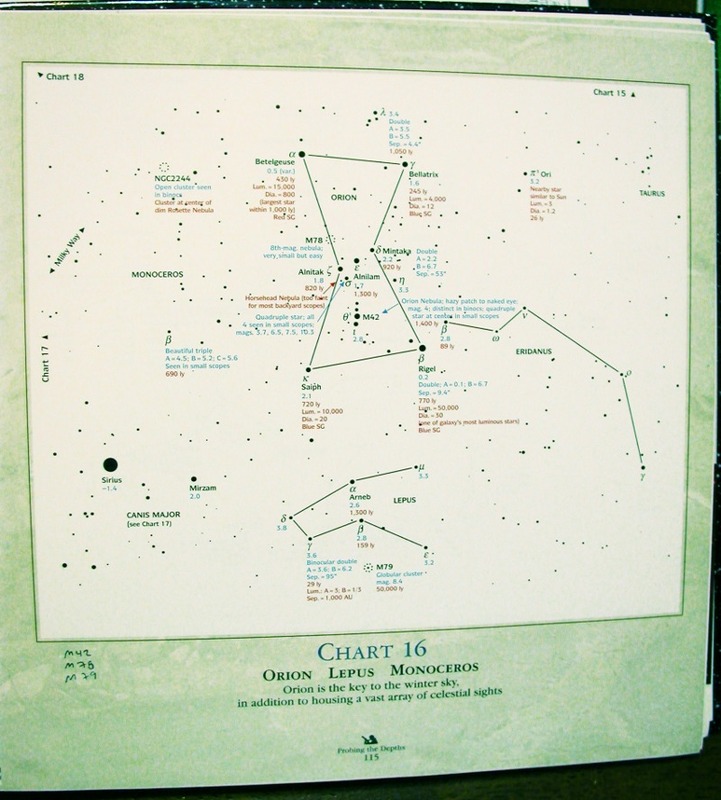 Its 16 sky charts are, for me, about the easiest to use and get a clear sense of where things are. Now, off topic a bit because I’m not sure where to post this but, Matt, I have a question for you. I went out the other night with my StarBlast 6 and found and sketched 3 different objects that all the guidebooks steer you to: Meissa, Struve 761 and the Mintaka double in Orion. All of these were fun to find for the first time, and exciting to view. But providing a far higher WOW! factor was this huge mass of stars lying in that vast area between Mintaka and Alnilam in Orion’s Belt. It was absolutely majestic. Stars of many different sizes and magnitudes fanned out in this beautiful stellar jewel box, the highlight being an arrangement that looked to me like a small quasi-Big Dipper adjacent to Mintaka. My question is why something like this isn’t on SOME list of Must-Sees? Is it because there are no specific (well maybe there are, I really don’t know) Messiers or NGCs in this area? Or is because this whole thing is too . . . differentiated (something like that) to be a clearly identifiable cluster or whatever? As a neophyte who has been at this all of 6 weeks, what I found as an accidental result of looking for something else between the two big Orion bookends is exactly the kind of thing I would want to be steered to, the kind of celestial object that has what great paintings have: Stopping Power. That quality that renders you unable to do anything but stop and look, and stay there. Looking some more. My question is why something like this isn’t on SOME list of Must-Sees? It is! You’ll notice that the brighter stars between Alnilam and Mintaka form a big S-shape. It’s a favorite target for binoculars and rich-field scopes, it’s just not listed in many places. Well said! That is exactly the feeling, easy to recognize but sometimes hard to put into words, that makes observing such an addicting pastime. I’m about a quarter of the way through the Herschel 400. There are a lot of possible reasons for going through a long observing list like that: to grow as an observer, to expand one’s knowledge of the sky, simply to have seen so many distant and wonderful things. One of the reasons that I haven’t seen discussed much, but which I think most serious deep-sky observers hold, is that in going through a list like that you are going to encounter a fair number of objects with that Stopping Power. The pages of my observing notebook are dotted with first-time observations like that. I was going to write more about that, and maybe give an example or two, but it just occurred to me that this needs to be a separate post. And possibly also an article for the PVAA newsletter next month. Doug, would it be okay if I quoted you for those things? Anyway, you hit on one of the reasons why I like binocular and rich-field observing so much. There are some VERY rich starfields in the Milky Way, where eventually I have to look away from the sky for a few minutes to let my brain catch up with my eyes. Try scanning northeast of Orion, in the triangle defined by Betelgeuse, Procyon, and the feet of Gemini (or find M35 and just wander south)–this is an incredibly rich area studded with nebulae, open clusters, asterisms, and chains of stars almost beyond number. I first ventured there because of the AL Bino Deep Sky club, and instantly fell in wonder. I’ll bet most seasoned observers have personal favorite areas like this–sounds like you’ve found one of your own. Darn it, that needs to be a post, too. You’re killin’ me, Rennie! First off, yes, of course. If you want to use any comment I make on your blog, do so any time you want. I’m flattered. I am relieved to know that I wasn’t hallucinating when I drank in that gorgeous spread of stars between Alnilam and Mintaka, that this is an area well-known. My only point was that this sort of thing is never something you find as a Must See in any of the guidebooks, of which I currently own about a dozen. You know it, other long time astro-vets do, but I just wish that there was an entire section is at least one book that directed we tyros toward layouts like this. You refer to this sweeping S-curve in the A-M open area. I just checked my sketch and this is what I referred to in my post as a small “quasi-Big Dipper” as I have another star that kicks up at the bottom to form what looked to me like the bowl part of the dipper. That area you describe NE of Orion sounds tasty. We are on tap for clear skies tonight, so I will head there right off, probably with my SB 6 and the 25. If you have any other similar star-rich regions, please pass on the location(s). See, this is just how much the sub-newbie I am. I don’t even know what the Herschel 400. But I will by the end of the day. Probably a little high up on the celestial food chain for me to deal with at this point. I am still very, very early into the M-hunting phase. Doug, the Herschel 400 is a list of 400 of the best and brightest deep-sky objects discovered by William Herschel and cataloged (along with thousands more) in the New General Catalog (NGC) and Index Catalog (IC). A lot of people who are really into the deep sky take on the Herschel 400 after they finish the Messier list. There are a few Messiers in the Herschel 400, and some objects that are bright enough and pretty enough that they could have been Messiers–if Messier had seen them!–but by and large the objects in the Herschel 400 are a little more challenging than the Messiers. Aperture and dark skies help when hunting Herschels–or just about anything else–but people have seen them all with modest equipment and from questionable skies. Most notable among these minimalist Herschel-hunters is one of my personal heroes, Jay Reynolds Freeman, who observed all 400 with a 55mm refractor. From your experiences in Orion it sounds like you might have a taste for deep-sky observing. If that’s the case, start chipping away at the Messiers. You’ll see a ton of cool things, you’ll learn a lot about the sky and about your scope, and by the time you’re done you’ll know more about your personal observing tastes. There are people out there who self-identify as SLAP observers–solar, lunar, and planetary–meaning that they rarely go for targets outside the solar system. And there are the hard-core deep sky observers, and the comet hunters and eclipse chasers…and people who do a little of everything, like me. As Uncle Rod says, there’s no wrong way to do amateur astronomy. Hi Matt (or as I refer to you in my communiques’ with another star-chasing newbie up here, “Mr 10MA”). Thanks for the information. I think that I will, for the intermediate future, stick with the Messiers and NGCs and also those rich fields that pop up here and there. I found a nice scattering around Procyon last night and did a sketch and another in Capella’s environs, though this wasn’t as densely-populated. Man, this is FUN. At this point, I am an all-arounder, that is I want to see the planets and moon, of course, but I am also fascinated by the DSOs (see, I’m even picking up the lingo!). Any other good rich field viewing tips? That area you told me about last time, NE of Betelgeuse was pretty much haze covered last night, that and washed out by moon illumination, but it is on my target list. Jay Reynolds Freeman is a god deserving Jupiterian status near the top of the astronomer pantheon. Just received a copy of Seeing in the Dark. I have long been a Timothy Ferris fan. I see essays by him in the NY Times from time to time and recall that back in the 1990s, when I was writing book reviews among other stuff for our local alternative paper, I reviewed his book The Mind’s Sky, also attended and reviewed his appearance at the Portland Arts and Lecture series. Fascinating guy, eloquent writer. Hey, you got your PhD from UCB and he is (or was?) a prof there. Did you ever run into him, or hear him speak? Same campus and all. I have checked out Uncle Rod’s blog. Good one. But yours is better. My Mak is scheduled for delivery next Tuesday. In the interim, I hereby beseech you to do some more celestial observing with yours and report the results.You know, this is just about one of the best LOOKING instruments I’ve seen. Hmm, hmm. You’ve only been doing this a few weeks, right? So the summer Milky Way will be new to you. Man, do I envy you that! The starfields in Sagittarius, the ‘steam’ of nebulae and clusters going up from the teapot, especially the M24 star cloud…holy smokes, that is mindblowing. The area around Cygnus is good, too, you can drop the magnification way down and just cruise around picking up clusters, nebulae, and asterisms all over the place. I strongly agree. You’ve seen his homepage, with all of his astronomy essays? If not, it’s here. I particularly recommend “Messier Surveys”, “Ten Thousand Objects”, “Visions of Lost Barsoom”, and the four essays at the bottom under ‘Writings about space travel’. Wow, small world! I gave a lecture at the natural history museum in LA today, and my wife needed the car so I took the train in. I wanted something new to read en route so I got The Mind’s sky on my Kindle just a few minutes before I left the house, and started reading it on the train. So far it’s excellent, as expected. Hey, you got your PhD from UCB and he is (or was?) a prof there. Did you ever run into him, or hear him speak? Same campus and all. I never did. Much to my chagrin, I wasn’t into astronomy at the time; I graduated from Berkeley in May, 2007, and didn’t have my astronomical awakening until that September. Ha! 🙂 High praise indeed. I’ll try to live up to it. My Mak is scheduled for delivery next Tuesday. In the interim, I hereby beseech you to do some more celestial observing with yours and report the results. I can do that. Stay tuned. You know, this is just about one of the best LOOKING instruments I’ve seen. Oh, for sure. I own three SkyWatcher scopes now and all of them have that black metallic paint that actually looks like a starfield. They have that quality that one also finds in certain sports cars and glass sculptures where you just want to reach out and stroke them, even though part of you is afraid of leaving fingerprints. All of my SkyWatcher purchases have been online, but I’ll bet if you got these on the showroom floor in a camera or telescope place they would just fly into buyers’ hands. Why Synta doesn’t paint their Orion-branded stuff the same way–or why Orion doesn’t request this paint job from Synta, whichever way the relationship works–I’ll never know. Thanks for the star field viewing areas. Already copied down in my notebook as future targets. The summer Milky Way sounds exciting, also too far off at this point! But I’ve already learned the value and virtue of patience in this endeavor. Bookmarked Jay’s homepage. A bounty of great stuff there, “How to Find Deep Sky Objects EASILY” has a special magnetism. I will roam around there a bit each day. Love his use of “Barsoom” in one title as I grew up reading all of the E.A. Burroughs John Carter of Mars series: Chessmen of Mars, Fighting Man of Mars, etc. I think you’ll enjoy The Mind’s Sky. I reviewed it a LONG time ago, but I recall it contains some musings on SETI and some parallels he makes between the structures of the human brain and the starry skies above. He is such a graceful and engaging writer. We had a clear and (relatively) dark night here last night and I spent about 2 hours out there with my SB6, looking and sketching. I found (make that “stumbled onto”) M44. I was scanning the general area where it is but having no luck and, suddenly, WHAM, there it was filling the circle. From all my studying I had the image all but tattooed on my brain and knew immediately that it was the Beehive. What a sight! Stars everywhere, all manner of brightness and size, and SO many! And, yes, damn, it DOES look a swarm of bees. Right up there with the Pleiades, but if anything even richer in stars and energy. Also found M41 for the first time, a very nice arrangement, especially the tightly-packed cluster at the center. Enough hazy star gas (is that what it is?) in a few areas to add a nice visually interesting accent. Also found some starry rich field areas below Gemini and somewhere around Procyon. Four sketches, so all in all a most enjoyable and productive night. I noticed that sparkly black coating on the SkyWatcher Mak and thought the same thing: looking at it is like looking up at night. Which I guess is the kind of association SW wants you to make! Orion’s metallic maroon finish is nice, but doesn’t have that celestial connection that the SW OTA has. Looking forward to the next chapter in you new Mak experience. My SkyWatcher Mak is scheduled for delivery this Tuesday, and I have a couple of questions for you that I hope will maximize my enjoyment and mastery of this cute little bugger. As I think I told you early on, I initially ordered the StarMax 90 from Orion as my first serious scope back in January, but after using it (rather, trying to) for 2 nights and being able to find NOTHING, I sent it back and ordered my StarBlast 6, which I am enjoying immensely. So I am still feeling a bit anxious about using a 90mm Mak, so here are my questions. 1. How will my viewing experience with the Mak 90 differ from that with my SB 6? I know that with the former I am trading field of view for greater mag, but this is really more of an abstraction for me at this point vis a viz how this will actually play out in practice when I use these scopes and, I hope, switching back and forth between them. 2. Given the Mak’s narrow FOV, should I be buying a really low mag eyepiece to use as a starter EP with the Mak just so I can find things before homing in with higher mags? Right now, my lowest mag EP is the 25mm Sirius Plossl that came with my SB 6. Excellent EP and works wonderfully as a first-use EP on any target object with the SB, but maybe not quite low enough for the Mak? I am thinking either a more Mak-friendly 32mm or even a 40mm, ideally some kind of wide angle variation. This is where I am really hung up, so your best advice here, please. 3. Anything else you can think of to get me off on the right foot with the Mak, as I think that everything I am learning about stargazing through the SB6 might or might not translate directly to the Mak. Btw, I received my mirror diagonal from Sheldon last week. Looks fine. He packaged it very well, totally protected. But here is what I don’t get. I paid him $8.50 total (shipping included) for this. It cost him $2.69 for postage, plus PayPal fees. So that means he made about 5 bucks on this sale. How does he do this and stay in business? Sure, volume makes up for some of it but he still needs to sell 20 of these to make just $100. Does Sheldon have a Web site, or is his stuff just hit and miss in the CN classifieds? Hey, I was reading around in your digiscoping section (I think this was the one) and found that some desert area photo you took of your son standing atop some ridge looking up, the whole foreground (boy and ridge) a solid black silhouette set against a dark blue sky. What a shot! Captures the absolute essence of that youthful wonder when looking skyward, a universal experience bound to have everyone thinking “Oh, yeah, I remember a moment like that . . .” Totally evocative photo. Anyhow, any tips/advice on my upcoming Mak experience (challenge?) MUCH appreciated. For starters, remember that each scope has its strengths and weaknesses. Maks are often described as specialty instruments for solar system targets and double stars. That’s not really true, lots of people also find them rewarding instruments for deep sky work, but it’s probably more true of a 90mm Mak than any other flavor. A 5″ Mak has enough aperture that most deep sky objects will be bright and fairly detailed. A 90mm Mak has light throughput similar to an 80mm refractor, but a narrower field of view, so don’t expect it to yield the same bright, expansive low-power views as your SB6. On the other hand, the Mak has a nice long light cone and is probably will be at least as well collimated as the SB6, unless you are a real whiz at collimation. So it will probably yield somewhat sharper lunar and planetary views, although the level of detail visible in the SB6 will probably be greater on account of its greater aperture. So here’s what I’d do with a new Mak. Jupiter is high in the western sky at sunset right now: have a look. Have a look at Mars. If you’re up late enough, have a look at Saturn. Run the magnification up and see how much the atmosphere will permit. When the moon comes around again, look at it, too. Starting with these bright, easy targets will let you test out the new Mak on it’s “home turf”–those objects on which it is likely to provide the most impressive views. Try it out in the daytime, too, looking at birds or whatever. This will give you more experience using it and more experience finding things with it, and it’s another area where the Mak will probably outperform the SB6–in convenience, if nothing else. Most of all, remember that telescopes are tools, and choose the right tool for the job. A 90mm Mak is not a widefield deep-sky scope, but on the other hand an SB6 is not as grab-n-go-able and may well yield less aesthetically pleasing views of bright objects. That doesn’t mean that you shouldn’t look at the moon and planets and double stars with the SB6 or that you shouldn’t look at Orion or M101 with the 90mm Mak–you absolutely should! Look at everything with both scopes to give yourself a better appreciation of their respective strengths and weaknesses. 2. Given the Mak’s narrow FOV, should I be buying a really low mag eyepiece to use as a starter EP with the Mak just so I can find things before homing in with higher mags? Right now, my lowest mag EP is the 25mm Sirius Plossl that came with my SB 6. Excellent EP and works wonderfully as a first-use EP on any target object with the SB, but maybe not quite low enough for the Mak? I am thinking either a more Mak-friendly 32mm or even a 40mm, ideally some kind of wide angle variation. This is where I am really hung up, so your best advice here, please. Get a 32mm Plossl, it will yield the largest true field of view in the little Mak. You could get a 40mm Plossl, but you wouldn’t see any more sky because of vignetting. I think that the reason there are eyepieces with longer focal lengths than 32mm in the 1.25″ barrel size is that some of the bigger catadioptrics have crazy long focal lengths–2000-3000mm for 8 inchers on up–and sometimes the lower magnification is desirable even if it doesn’t bring in any more sky. I would not mess around with a widefield EP right now. A 32mm Plossl is a good workhorse EP that you can use in both of your scopes to get the max TFOV. Try it out in both of them and see what you think. If that sort of thing appeals to you, you can always get a 24mm Panoptic or Stratus or the like down the road. But right now, since you’re just starting out, I say KISS. (3) try it out on the moon, planets, and double stars first so you can see it shine at the things it does best. I can understand your trepidation since a 90mm Mak was your first scope and you didn’t like it. I’m not surprised. I don’t think a 90mm Mak is a very good first scope. I think a first scope should have a wider field of view, minimally, and probably more aperture. There’s a reason why 6″ Dobs get recommended as the best beginner telescopes: they’re forgiving, they show everything pretty well, they’re really Jack-of-all-trades instruments. With all that said, I think a 90mm Mak is pretty close to ideal as a second telescope. It’s more portable than a 6″ Dob, so you’ll probably find yourself using it in situations where you wouldn’t otherwise be observing (when traveling, quick peeks, looking at birds or daytime scenery, etc.). It will probably have very sharp optics. It is less forgiving when it comes to finding objects in the sky, but the skills you’re learning on the SB6 will transfer over. Most of all, get out and use it. Put it through its paces. Get familiar with it. Don’t get down on either of your scopes–they’re different tools, and they have separate domains of best performance. Find out what those are, by direct experience under the stars. Excellent stuff, Matt! I just ordered a 32mm GSO Super Plossl from Agena for $36 w/free shipping. It had 5 stars from I think 10 of the 12 reviewers, one of them claiming it held its own against a Televue that cost 4x more. So this should work well as my first-view, default EP for the Mak. So when the Mak gets here tomorrow, I will assemble it and try it outside in the daylight with my 25 and then the 32 when it gets here. I previously ordered one of Agena’s 15mm Super Wide Angle EPs and it just outstanding, fast becoming my favorite EP with the SB6 which, I think, is spoiling me as it is such a fun and easy scope to use and the brightness and sharpness are superb. It serves up such sweeping vistas. I am still anxious about the narrow FOV, but only using it and gaining at least some modicum of competence with it will tell whether it will wind up as my second scope and #1 grab-n-goer. If the Mak ends up not working for me, would Orion’s little GoScope 80mm refractor be a good second scope choice, or would it merely be a diluted version of my SB6? Other than the portability, that is. Do you have any kind of digiscoping/afocal/white trash astrophotography tutorial or something similar on your blog? That is, some how-to info based on the way you to it. I am frankly amazed at the quality of the photos you post that are taken by pointing the lens of a 10-year old digital point-and-shoot into your eyepiece. Just doesn’t seem possible. And yet, there it is. Doug, the WTA tutorials you are looking for are here and here. I think that other than portability, the GoScope 80 would be just a diluted version of the SB6. IMHO for a second scope you want to skew in the opposite direction, i.e., you’ve already got a big widefield scope, now try a portable planet-killer. Seriously, try out the Mak on Jupiter and the moon and maybe a couple of double stars, run it up to high mag, and see what you think.